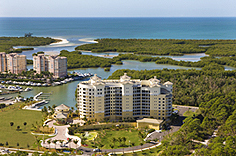 Just north of Wiggins Pass Road, Aqua occupies a prime location in the Pelican Isle complex. This boaters’ paradise is located on Aqua’s yacht harbor and looks out to Wiggins Bay and the Gulf of Mexico. Residences span from a spacious 3,940 sq. ft. to 6,599 sq. ft. of living area and feature deluxe finishes and gourmet kitchens with gas cooktops. Owners enjoy amenities including a private marina, sky lounge with a roof top terrace, resort-style pool and spa, theater, social rooms, virtual game center, outdoor putting green, dog run, guest suites and cabanas. Pets are allowed. Optional membership in the adjacent Pelican Isle Yacht Club is available upon club approval.